This Economy Table Skirt with Rounded Corners Offers Shoppers an Affordable Solution for Banquets! Don't Waste Money Renting When You Could Own Plain or Custom Covers! Buy the Table Skirt You Need from the E-Store Today! 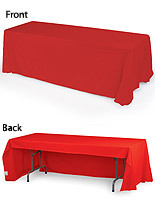 Standard cloth covers all (4) sides of 8' x 30" x 30" table. Rounded corners for a polished look. 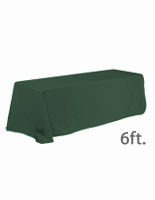 This table skirt is an excellent marketing tool for expos and promotional events! 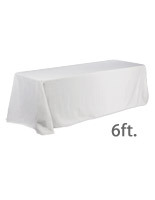 Cover your folding tables with attractive tablecloths. This linen throw, table skirt is made from 100% polyester fabric that is machine washable and wrinkle resistant for easy maintenance. 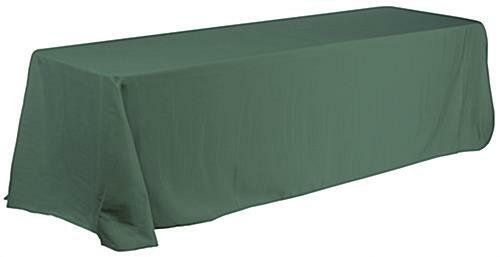 The hunter green linen cover will complement any tabletop display. 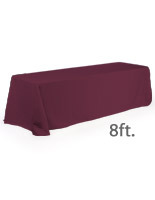 The attractive table skirt is sure to grab potential customers' attention! A tablecloth is a great for trade shows, job fairs, exhibitions, banquets, school functions, hospitality events, and sales meetings. 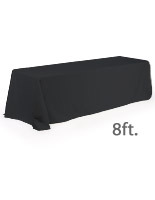 The table skirt fits standard 8' tables, dressing up your exhibit quickly and affordably. Each is hemmed at the corners to properly align with tables. The table skirt is sewn with rounded corners and the fabric falls to the floor on all sides. 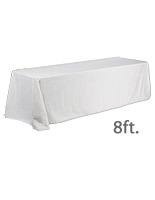 In fact, the linens drape four sides of an 8' x 30" x 30" display table. To make your exhibit look more outstanding, you can even add a custom table runner or skirting for more of a visual impact. Give your display a professional look while increasing the exposure to presentation with this trade show table skirt.